To make things specific, Column name: Attached Files (Multi-valued, Links to the Source Name of the File) Lets say this specific item has file named "file1.doc" value to Attached Files column, Then i want to update this column with a new document named file2.doc... i want the result of Attached File column for this item to be links to "file1.doc" and "file.doc"
EDIT: Thanks andrey for your input. Regarding the getting of previous data, im having trouble on this one... On its simplest form, I tried to set the value of Attached Files column to its own value before i add the current item value for debugging purposes coz if i directly jump to "current + new item" addition i got an error that's why i made it simple first but still i got an error... How can i add the new item to the current value if setting it to its current value gives me an error already? Im expecting that this would just be fine since i'm merely overwriting the current value with its current value :). Am i right? 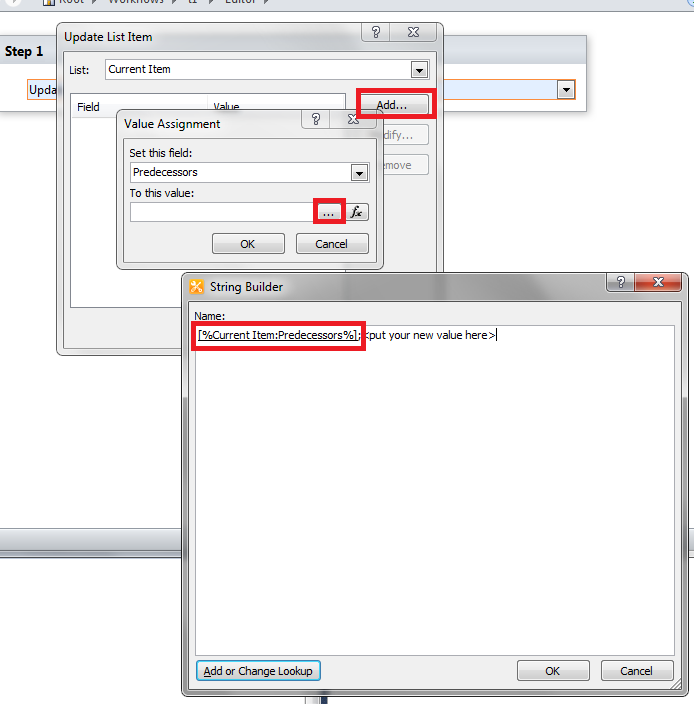 Usually if you want to add value into multivalue field in SharePoint Designer, you should set value to the existing value plus the new value. I used this approach several times in real world projects and it works quite well. P.S. Please don't forget to check if the current value is empty, in this case obviously you should use your current code. Not the answer you're looking for? Browse other questions tagged 2010 sharepoint-designer workflow lookup-column updatelistitems or ask your own question. How Can I Use A Workflow to Update a Multi-Value Lookup Field? How to take a value from a single line of text field in one list and set it as a lookup field in another list?